We’re closed on Thanksgiving, Christmas, and Easter. 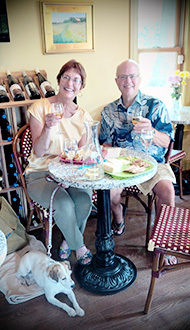 Welcome to Perigeaux’s tasting room with its excellent views of the vines and the Patuxent River. Nestled in the middle of the four vineyards and under the canopy of ancient oak trees, the tasting room is warm and inviting – perfect to sample our wines, or relax and enjoy a bottle with friends inside or on the large deck outside. Opened in 2012, the tasting room is located in one of the former tenant houses on the property and was conceived to showcase both great wine and sustainable design principles. The large front room, with its graceful arched opening to the main vineyard, has high open ceilings with the intact rough-sawn timbers and planking exposed. By working with original materials, we preserved the feel and craftsmanship of the existing structure and minimized the environmental impact of the tasting room. Through this adaptive reuse, surrounding old oak trees were protected, new framing materials were minimized and truckloads of potential waste materials were diverted from a landfill. The tasting room design highlights the form and scale of traditional southern Maryland architecture, even as it creates a grand new space for festive gatherings. Inside the main space, a granite topped bar allows visitors to sample wine, ask questions, and meet others. Antiques and some of the original winery equipment are on display along with artwork and crafts available for purchase. You can view a video presentation of the harvest which shows Perigeaux at the harvest. The images include scenes of how our wine is made onsite with photos of vineyard workers, the crush at the winery, and the wine pressing. Guests arrive to the tasting room along a walk through our vineyard with opportunities to see the vines up close. On visits through the growing season, you can see the progress of the Cabernet Franc, Cabernet Sauvignon, Merlot, Zinfandel, Chardonnay and Pinot Gris grapes as they develop from blossoms to berries and on through verasion. 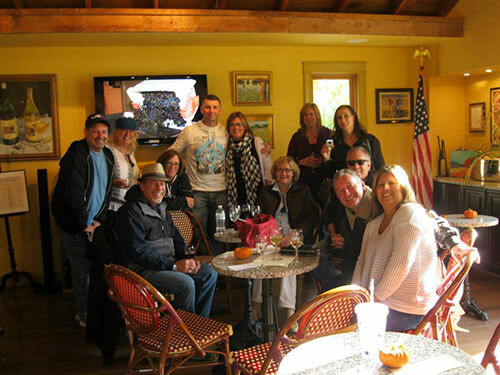 Tours of the winery start at the tasting room and include a guided walk through the vines. Groups can picnic and enjoy the views from the deck and lawns surrounding the tasting room. Relax under the shade of a 200 year old oak and spend the afternoon sipping your favorite wine with a friend. 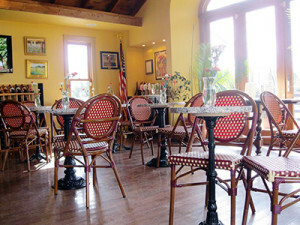 Use the left and right arrows in the images below to scroll through photos of the Perigeaux Tasting Room.